The Sky-Watcher 8” Collapsible Dobsonian telescope is a travel-friendly, yet powerful amateur telescope that retails in the sub-$500 price range. Eight inches of aperture make this an entry level scope for the serious astronomer; you have moved past the beginner level. Sky-Watcher's 8” Dob has a solid rocker mount, flat equatorial disc stand, and a 1200mm focal length with a 203mm aperture designed for deep-field viewing with ease. If great imagery of galaxies, nebulae and star clusters is your backyard stargazing desire, then this scope may well satisfy both your astronomical and financial desires. With the Sky-Watcher's 8” aperture, you’ll gather so much light that your images will be viewable at a high magnification than you'll get with smaller scopes. This allows resolution of smaller details on the surface of the moon and brighter planets, as well as the deep space objects that a light bucket such as this excels at. If your wallet is less constrained, the Sky-Watcher 8” Collapsible Dobsonian also has two bigger brothers, with diameters of 10 inches and 12 inches respectively, that will show you even more detail and even fainter objects. In this article, we’ll review the specifications and merits of the SkyWatcher 8”, and see which features owners love... and which they would like to see improved. The SkyWatcher 8” Collapsible Dobsonian telescope is built for the serious amateur astronomer to have access to a powerful yet portable platform at an affordable price point. The telescope’s large aperture - a full eight inches - it is known as a “light bucket” style telescope. Its job is to collect as much light as possible so you can see more detail and fainter objects than a smaller scope at the same price can show you. The SkyWatcher 8” boasts dual eyepieces, a large mirror, and a f/6 focal ratio. The highest useful magnification you’ll get from the SkyWatcher 8” is quoted as being 406x. However, this is somewhat misleading, since atmospheric conditions will rarely let you enjoy more than 200x. But, don't worry about that too much. If deep space is your thing then its the light gathering power of this telescope which matters more than magnification. With a limiting stellar magnitude of 14.2 you have the ability to tease out views of incredibly faint and distant objects. Bigger magnification, as for most scopes, is reserved for bright objects. The specs of Sky-Watcher's Dob mean you’ll see the surface of the moon in mind-blowing detail, and the details you'll see in Saturn's rings and Jupiter's belts are a step beyond what beginner scopes can expose. Not many astronomers appreciate that the name 'Dobsonian' actually comes from the mount, rather than the telescope. The telescope itself is actually a Newtonian-style reflector, but it is mounted on a Dobsonian cradle. The big benefits of the Dob mount are simplicity, effectiveness and low cost, which means more of your dollars can go into the telescope itself. This is why Dob's offer more inches of aperture per dollar than any other telescope style. Like most Dobsonians, this Sky-Watcher is moved manually and can be locked in place, swung quickly or moved in smaller increments, all thanks to the teflon-coated rockers and built-in tension clutch. The downside of the Dobsonian design is it is not computer controlled, so all tracking has to be done manually. Also, unlike an equatorial mount, the Dobsonian has to be tracked in two planes: up & down and left & right. This is not actually a big deal - and most users consider it a small sacrifice for an affordable large scope. One final benefit of a Dobsonian cradle is its simple and elegant design which can be repaired with basic parts that you’ll be able to find at your local hardware store, if necessary. As its title suggests, a big claim of this Sky-Watcher 8”, is its ability to be collapsed and extended as needed for travel purposes. The ability to easily break this telescope down is a big benefit if you want to use it in different locations. When it is made up it is a big old beast. But, dismantled, it’ll fit into an SUV or perhaps a duffel bag without any issues, although you shouldn't expect to fit it in carry-on luggage. Easy portability is clearly one of the advantages of this telescope, but it comes at a cost in weight. Because there are external struts which the telescope uses to collapse and extend, there are more metal parts than other telescopes, which adds to the overall weight. The 8 inch telescope itself weighs 24 pounds, and its stand is a not lightweight 33 pounds, which means that while portable, you won't be moving it around often if you don’t need to. Be aware that you’ll need to assemble the SkyWatcher 8”, which, while not difficult, may be daunting for new, aspiring astronomers. All of the tools required for assembly are included with the SkyWatcher 8”, and the video below shows you the general principle of the collapse in action. (Note: this video is from 2008, so detailed designs may vary today). The SkyWatcher 8” is well received among reviewers, who laud its power at its relatively low price point. For a good visual overview of what the SkyWatcher 8” can do in a user’s hands, check out this video - but ignore the last three minutes or so, you are not going to use this scope for terrestrial viewing. 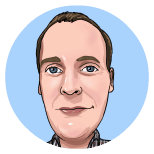 Let’s look at a few of the things people are saying about the telescope so that you’ll get a good idea of user impressions firsthand. Typically owners review this telescope with praise for the quality of the telescope’s build and its size to price ratio. You can see many positive reviews on Amazon by clicking this link. 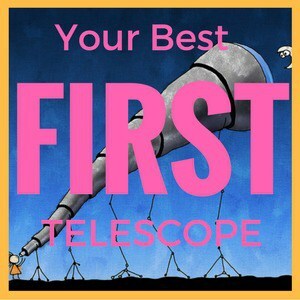 So you are aware, this telescope gets delivered in two pieces: the telescope tube itself and the Dobsonian base. These don't always arrive together. The second concern has more relevance. This is a reflector-style telescope and will need collimation on a regular basis to keep the mirror focussed in the right place. What's most annoying for new users is this will most likely need to be done straight at the box too. If you've never collimated before, it can be daunting. Fear not though, it is a relatively simple process and we've got a complete beginners guide to collimation to help you out. 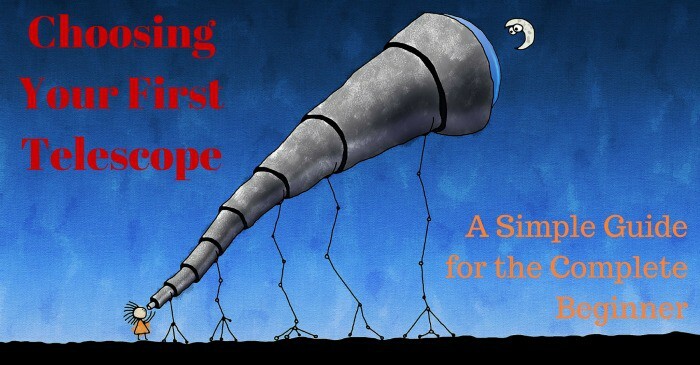 A few users on the Astronomyforum.net website claimed that the 8” size point is better served by a non-collapsible style telescope for the sake of portability. These comments are mirrored by others on the iceinspace.com.au forums, who state that the added portability afforded by the collapsible scope isn’t necessarily a big addition for the size. Almost all the reviews we examined were incredibly positive. According to owners of this telescope the SkyWatcher 8” Collapsible Dobsonian is an excellent telescope! The SkyWatcher 8” Collapsible Dobson Telescope is a great pickup for astronomers looking to make their first big telescope purchase or who are upgrading from their 'beginner' scope to something with a lot more power. 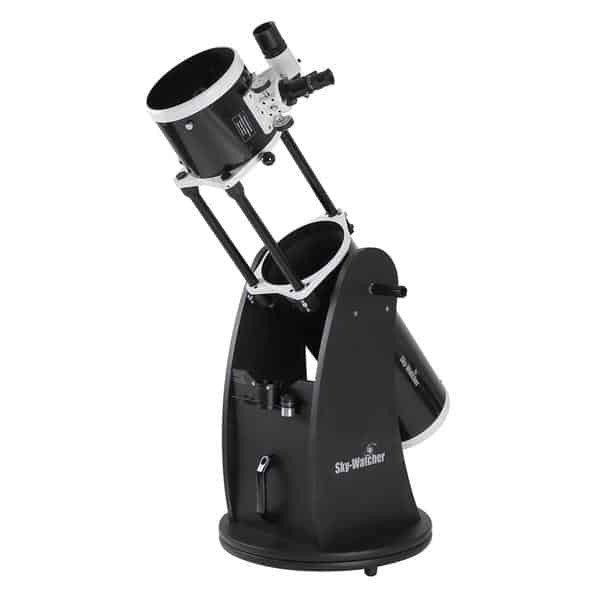 The SkyWatcher 8” is very affordable, powerful and easy to use. It's collapsibility may not be a huge selling point, but if you are travelling with it or have storage constraints in your home, this telescope will let you make the most of your space. Most users who understand what they are doing have nothing but praise for the SkyWatcher 8”, with the biggest challenges coming from owners who didn't appreciate what's involved with owning and using any large Dobsonian telescope. If you’re looking for a serious light-bucket telescope for a beginner's price, check out the SkyWatcher 8” and experience what this finest telescope can help you see!